Do you feel anxious when you hear the bell of the school year? It only means that a lot of changes may happen on the road. The massive amount of traffic during pick up times and drop off, combined with possible road hazards can really add up to the stress that truck drivers may feel. According to the NSW Department of Education, speed limits near or within school zone area should be reduced to 40km/h, between 8am to 9:30am and 2:30pm to 4pm. Truck drivers should follow traffic rules and speed limit to avoid vehicle collision. It will also give you enough time to stop when a kid is crossing the highway. Always keep your hands on the wheel and your eyes scanning the road. Avoid any distractions such as loud music, or using your mobile phones. When passing school zone, you must expect large traffic volume as parents are sending their children to school as early as seven in the morning. Traffic congestion usually occurs at around 4pm. To avoid a delay in your delivery, allow for increase travel time. Look out for cyclists at all times. You will see them coming from different driveways as well as riding along the road so you have to stay alert. On a road with a 60 kph speed limit, you must leave a 1 meter space. On a road with a speed limit above 60 kph, you must leave a 1.5-meter space between your truck vehicle and the cyclist. Keep scanning your side mirrors to see cyclists around you. Sometimes, truck drivers are in a rush to deliver their goods on time. This is not an excuse to disobey school zone traffic signs. 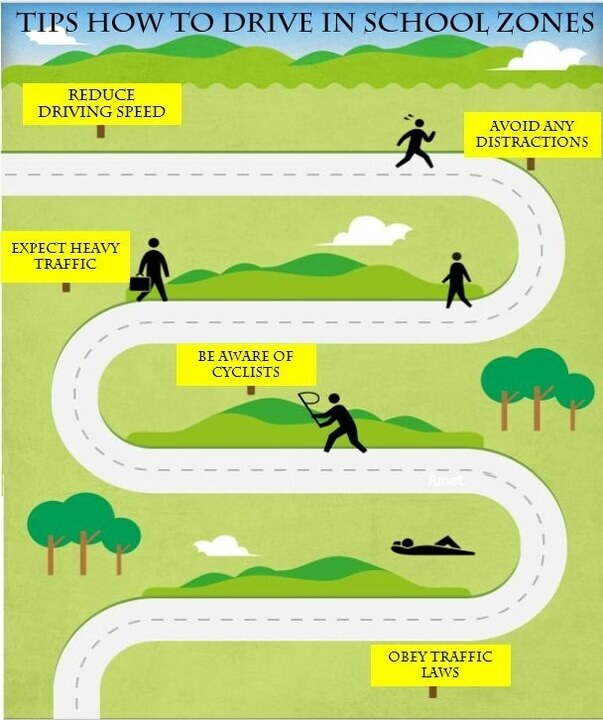 Following road signs will help you reduce the chance of getting into an accident.This Infographic presentation was designed to help you drive safely in a congested area like a school zone. Burleigh Driver Training School wants to remind everyone to stay vigilant and keep these helpful tips in mind.Take it easy, drivers!